That north point of Alameda Island is really freakin’ me out. Yesterday I purposely started early to beat any wind. It was predicted to be only 5-7 mph anyway. I arrived at the dock at 6 AM to cold, cloudy and windy weather. It was already reading 10 mph with gusts even higher. My plan was to paddle to the north and “peek around.” I guess the currents and wind make this an unpredictable spot. I didn’t get too far before I decided to just turn around and go south. The winds were getting worse and I was worried my day might be shortened altogether. Turning south put me against the current. Oh well. Here’s my route. I did round the south point and get into the Bay. This is near the area where I had to get off the water last week. Boy did it look different. My schedule called for 20 miles. I did a little backtracking to get all the miles in. This entry was posted on June 21, 2010 by DummyDiva. 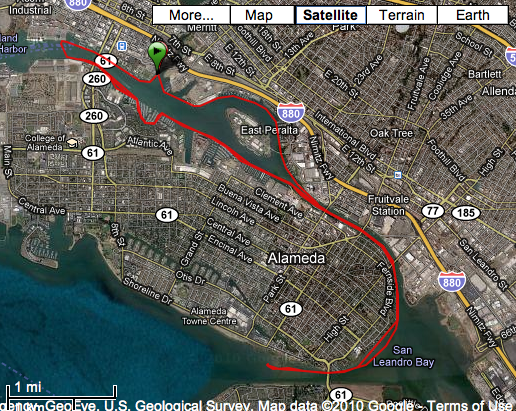 It was filed under Uncategorized and was tagged with Alameda Island, kayaking, Oakland Estuary, paddling, training.